1 small Scallion, sliced into thin rings. 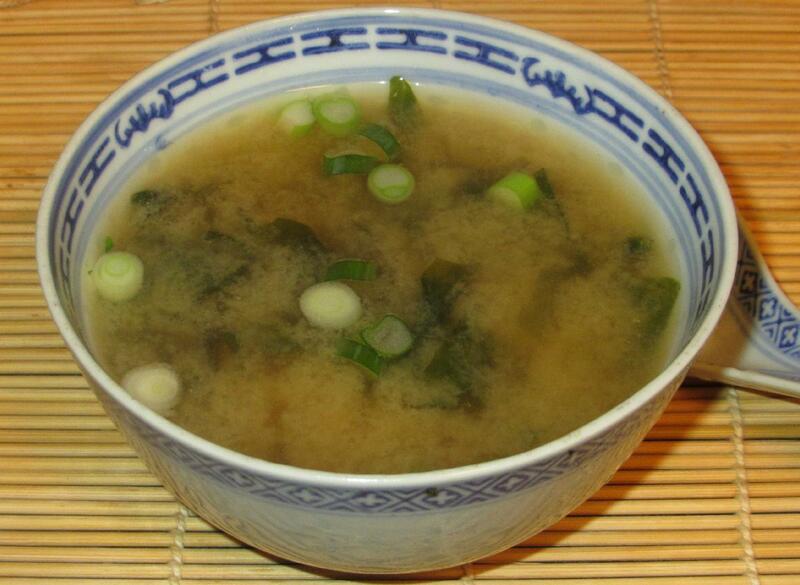 NOTES: The basic rule of thumb for a miso soup is 3 tablespoons for every 4 cups of stock. I am just making enough for two people here and you may wish to double the recipe. If you prefer a strictly vegetarian preparation, you can make a dashi that does not contain Katsuobushi, such as Kombu Dashi. 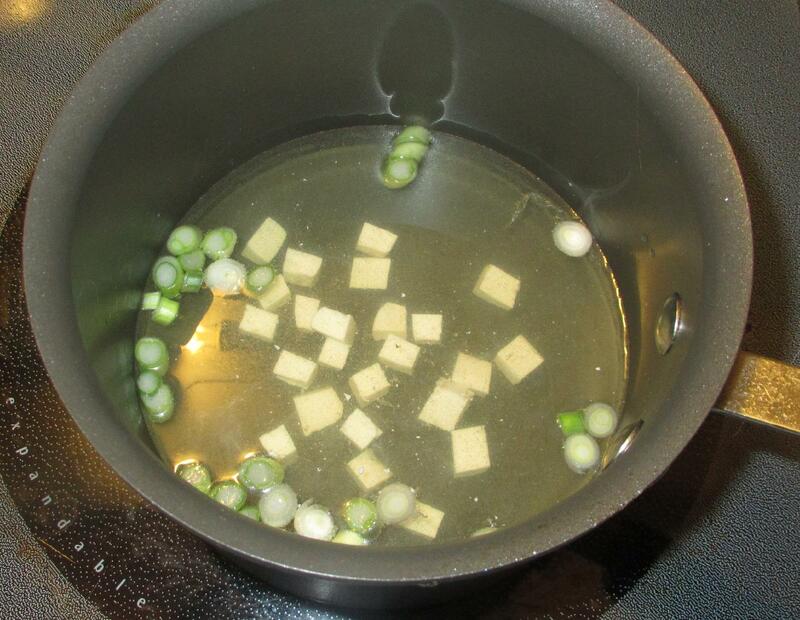 Add the Dashi to a pot along with the white parts of the scallion and the tofu cubes. 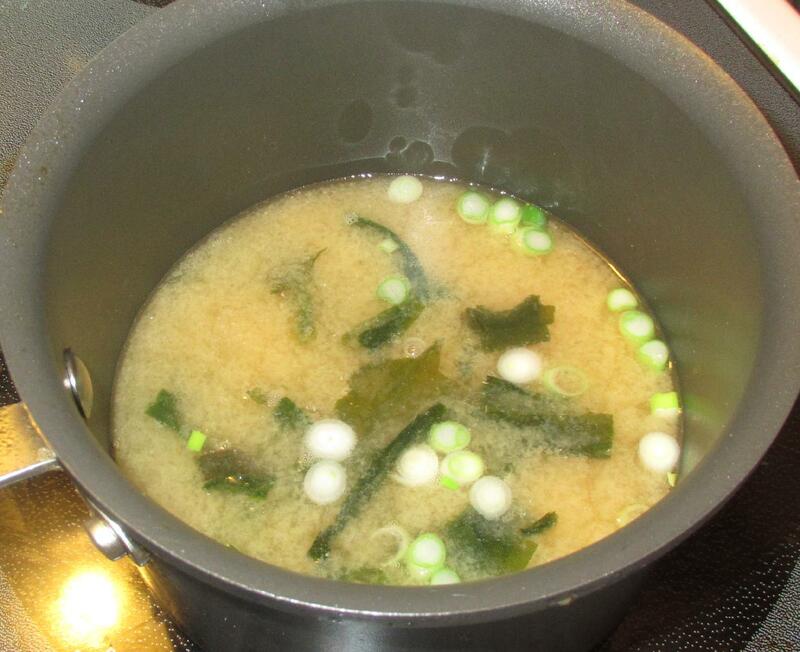 Bring it to a gentle simmer but do not allow it to boil as this will diminish the more delicate flavors of the dashi. Put the miso in a small bowl and then scoop a small ladle full of the dashi over it and mix well before adding the contents back into the main pot. 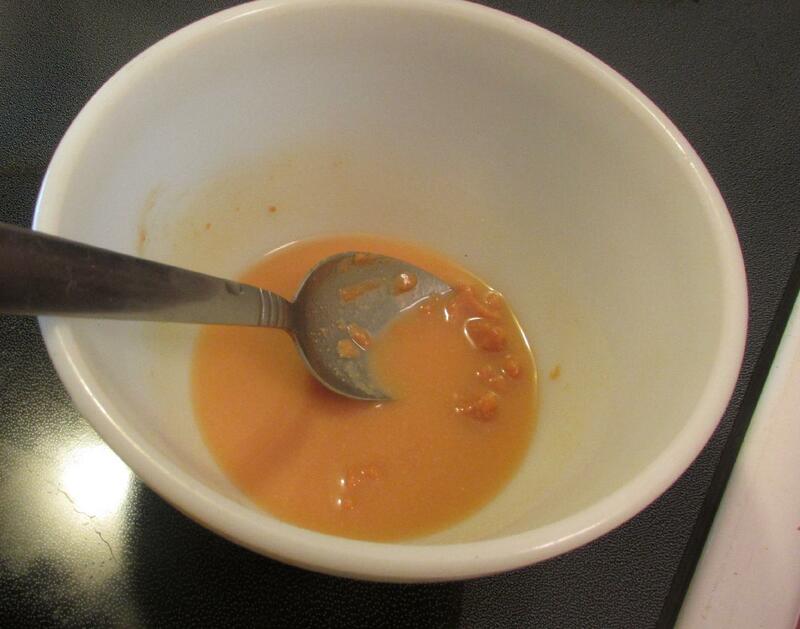 It is advisable to use this method as it is easier to mix the miso into the liquid this way. Again, do not allow the contents of the pot to boil. Add the Wakame and allow everything to heat through. Finally, transfer to individual soup bowls and garnish with the green parts of the scallion. By the way, you may have noticed that no salt is added. This is because miso is quite salty already. You may, if you wish, add a little pinch of white pepper, or a few drops of sesame oil just before serving. Oh, goodie! Now I can use more of the yummy umami miso (say that three times fast) I got for the salmon, which was fan.freakin.tastic! Is there umami as rich as the soup made without the dashi? What could a nonfish-eater use, maybe mushroom of some type? Maybe be nontraditional with the tofu in prep? The katsuobushi dashi stock is what I use, because I think it lendsfullness, but I have friends who are strict-vegetarians. and you mention that Kombu dashi is popular,. But are there other umami enhancers that can be added to this soup, when you only want to make one soup for all of your friends at the dinner table? That is interesting, as well as motivating… Will try an experiment with Shiitake (dried) and use different temperatures of soaking water to look into possible degrees of biiter taste. (I have always soaked with tepid purified water, in the past.) Thanks, John!